In January I took my cat to the vet because his right eye seemed to always be running and didn't have the same reflective properties as the other eye. They said to just watch it. I took him back three weeks later as it had not improved and was still running. (Clear tears). They gave him an eye ointment containing an anti viral, a steroid and an antibiotic. The eye seemed to get worse so they referred me to an animal eye specialist. Initially they gave me a water based (Cidofovir) anti viral drop and a Ovaban oil based drop that seemed to irritate his eye more. I took him back, they said there were no abscesses, and switched him to an oral round of the Ovaban. Two weeks later, the eye is worse than ever, the inner corner of his eye is now enlarged and they have started him on an antibiotic ointment. (Erythromycin) Nothing has made a difference and every his eye is worse now than when I brought him into the vet in the first place. I would appreciate any suggestions as I am bringing him back to the eye specialist but am losing faith because when I called them, they asked me "what would you like to do?" I empathize with you. Some cat problems can take weeks, months or even years to resolve and it’s no fun watching your little furry friend continue to have problems. What immediately came to mind when I first read your question was that the treatments you described sounded like they were treating Feline Herpes Virus infections. An especially common cause of cat eye problems is typically FHV. Cats can have this virus in their system in a latent stage for years without showing any signs. When a flare-up happens it can be caused by stressful events and strangely enough, in adult cats, only one eye may be affected. Many cats show signs of hepetic infection after an event like illness, surgery, boarding or a new pet joining the household. The drugs that your cat was given such as cidofovir suggest FHV treatments but the drug Ovaban (Megestrol Acetate) is usually given for skin problems in cats and alleviation of false pregnancy in dogs. It affects the function of the adrenal glands through its steroid effects. It has become an almost obsolete medication because of the many side effects…and there are many other safer drugs available. Cidofovir is a powerful, broad-spectrum anti-viral drug. It is used in cats to treat infections of the eye (conjunctivitis and keratitis) associated with feline herpes virus (FHV-1). Cidofovir has been found to be effective with twice a day administration and a relatively short duration of treatment. However, there can be drug interactions and the anti-viral activity of cidofovir may be decreased by topical ophthalmic corticosteroids. Other drugs that are used for FHV and anti-viral uses are Idoxuridine, Famcicolvir, and Lysine. Famciclovir is a newer oral anti-viral medication that shows promise in cats and there are very few side-effects. Lysine is for cats that suffer frequent bouts of recrudescent disease. While lysine alone will not eliminate a herpes virus infection, lysine can decrease the severity of clinical signs and increase the time between recurrences. Lysine is safe; however, it should be administered with food since it may induce vomiting if given on an empty stomach. This is available in powder, paste, gel, and tablet. L-Lysine is an amino acid (a building block of protein), which theoretically prevents Herpes from reproducing. My suggestion is that you talk to the veterinarian or the eye specialist vet you’ve seen…and find out what their diagnosis is. Is it caused by FHV? Is it Glaucoma (fluid pressure within the eyeball becomes elevated and can show signs such as a bulging eyeball, cloudiness in the cornea)? Is it Uveitis? Get the information from the vet. In the meantime you could try something like one of the Lysine products available over the counter. It won’t hurt him, may benefit him, and perhaps give him some relief until you can get the info from the vet. Also Try our NEW! Felisyl Immune System Support A Lysine supplement in a palatable flavor powder for cats. Viralys is recommended as an aid in the treatment of Feline Herpes Virus and its associated respiratory and ocular symptoms. Vetri-Science Vetri-lysine Plus Soft Chews (120 chews) is a highly palatable chicken liver flavored soft chew formula designed to support Immune System Function for cats and kittens only. 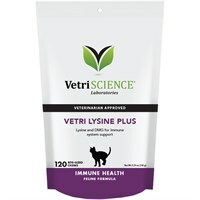 Vetri-Lysine Plus Supports Immune system Function Collagen formation Tissue repair Antioxidant activity Antibody and Lymphocyte production Directions Adult Cat : Give 1 or 2 soft chews, twice daily. Kittens : Give 1 soft chew, twice daily. Although the link they gave me has a "Buy" button, you can click on it and just get more information without making a purchase. You can probably find the products in a pet store near you but at least you’ll have some information on what type of thing to look for. Comments for Eye Issues and no treatment can be found? Cat about 6 yrs old developed eye infection about 6 months ago. At first it didn't seem too bad and I treated him with some Tobramycin drops left from a problem when he was younger. Seemed to clear up some but I ran out of drops & then it got worse. 3 months & close to $900 later he has been through 10mls cidofovir,full script of oral antiviral and still has discharge. Unfortunately nothing here worked for my cat. They discovered small cell tumors behind the eye and the only option was to remove the eye. I opted not to have this done as my cat was about 15 years old and the cancer was also throughout the nasal cavity. I treated him at home with ointment, drops until he became too uncomfortable and had to make the difficult decision to have him put to rest. I hope and pray your situation turns out differently. I am currently going through the same thing with my cat and was wondering if you had any luck?